We have not decided on the exact date yet. It will be one day next week. Thinking about an outside wedding ? I have been told that our web site is just too big and overwhelming for a customer trying to plan a simple home wedding. So I am going to try and rectify this. I have no idea how I am going to do this, so we will just see where it takes us. A small wedding at home can be a very special time, the longer the bride has lived at this home the more meaning it will have. I remember well a very special wedding in Waycross, Ga.
a number of years ago. The family purchased the house in a new sub-division when the bride was three months old, they also acquired the lot next door. The vacant lot next door was planted in grass and kept mowed. It became the hangout for the neighborhood kids, a sand pit and swings were added over time. When it came time for the daughter to be married, she would consider no other location for the event. We took down the swings, mowed the grass and put up the tents. 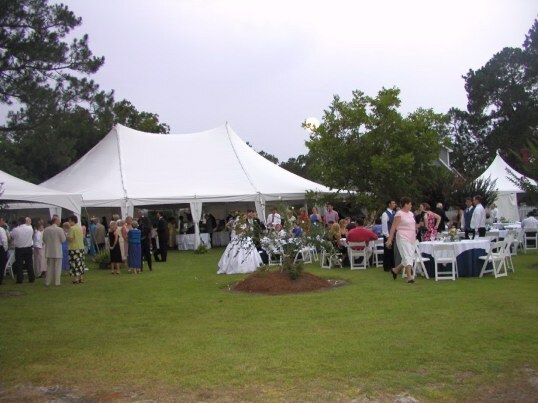 A typical home wedding would use a 40x60 tent. A dance floor and stage for a band or DJ. You are having a "garden" wedding and not a "tent" wedding. Tables and chairs outside are great. 09-10-12 I will keep adding a little each evening. Still thinking. busy right now. So we can say, "first things first" and what is the first thing to do when planning a wedding? of course selecting the groom is of utmost importance. Next what else if going on that day, sports games, homecomings, graduations, other weddings?. If you live close to a large town such a Tallahassee certain activities can tie up every motel room within 100 miles. A close friend with whom you share mutual friends should not be getting married on the same day. This can be quite awkward for all involved with both weddings. Be sure to ask photographers, caterers, florists, folks like us and just anyone you talk to, if they are aware of any other events on your first choice date. at the back in case it is contagious. For the reception a lot depends on whether you are serving alcoholic beverages. If you are serving just beer and wine, or even a full bar, less seating will be required. drink and not think about food until later, seating for less than half the guests will be adequate. Now if you are having a plated meal then all the guests need to be seated.